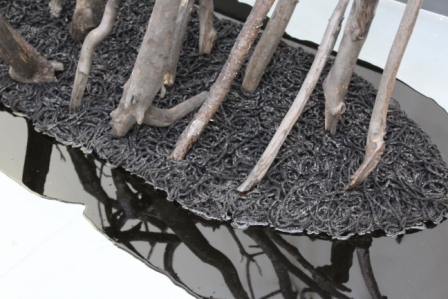 So last Thursday I went to the preview of Sarah Daglish’s exhibition ‘Ichor’. It was my first exhibition preview I’ve been to with the intention of blogging about it. Normally I’m just an exhibition addict because I love seeing new things and discovering new artists. Now however I have the urge to write about and explore what I’m seeing. Which is very exciting. And slightly nerve-racking. Stupidly I didn’t bring my camera to this preview (a mistake I will not be making again…) I felt kind of naked without it and of course had no images to accompany the thoughts that have been sitting dormant for over a week. So I ran back in the other morning to take some snapshots and here I finally am sitting down to write. I don’t know what I was really expecting from Daglish. The poster was in my opinion relatively illustrative in comparison to the work which was far more sculpture-orientated. In some cases you could argue this is misleading, but I liked the mystery it held. The poster gives nothing away therefore when you walk in your are met with the work for the first time. And that air of ambiguity really worked on preview night. I was not expecting moving image, yet there was a very mesmerising film of pouring liquid played on loop. I definitely was not expecting there to be such an emphasis on material, but that formed the basis for the entirety of the work. In the case of ‘Sweet Bath’ you have liquid oil and smoked paprika encased and contrasting with solid tin. Oil and paprika are not only both edible materials, but they also appeal to multiple senses including smell. The bath contents were so tactile looking I almost had to resist the urge to dip my finger in it! But that was how the entire exhibition worked. You wanted to touch, you wanted to smell, you wanted to experience the material and I loved that. It was almost as if you could see and feel the relationship Daglish had during creation. Well, you definitely could in the case of the burnt wood. I was speaking to her and she was saying that given these were done in her back garden, there was very much a danger element to burning the wood. And again a sensory element – simply by looking you could almost smell the burning and hear the crackle of it. I was very impressed when she told me her garden shed was essentially her studio. You’ve got all these industrial kind of processes going on, such as with the stamped copper plates, in the least industrial environment. A back garden. The most simple of places. A garden is now officially on my wish list! Yet half of the elements present in this exhibtion could not have been entirely tested in a garden, therefore it becomes evident how truly willing Daglish is for her materials to take control. She “never quite knows what’s going to happen” and that is the magic of it all. She is at the end of the day merely playing about and testing materials. Experimenting. I would even go as far as describing her not merely as an artist, but as a chemist. 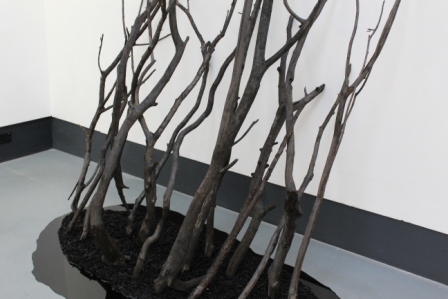 Her work is essentially an exploration of material properties; the change they undergo when mixed or burnt. 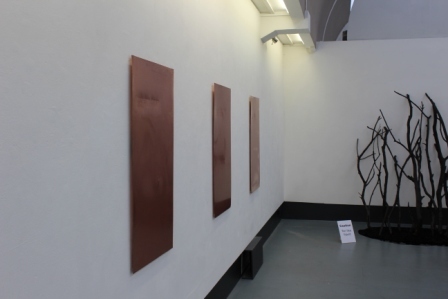 There is also a presence of chance and the will to allow a material to evolve itself, such as with the copper plates which Daglish believes will eventually oxidise. Another thing that really got me was the reflections. I don’t know if this was intentional, but given her depth of material understanding I’m going to assume it is. Her use of the fluids against the solids worked beautifully in the sense that people’s reflections fell across the liquids creating a movement in the otherwise static works. This was the case with both ‘Sweet Bath’ and ‘They Eat Not Man’s Food’ (above). Not only that, but there is the contrast between these liquids themselves. In the case of ‘Sweet Bath’, the liquid is encased in a solid frame (which Daglish was hoping would not leak!) and then with ‘They Eat Not Man’s Food’ it sprawls itself in a lazy puddle across the floor. Again there is edible material present, although this time it is in the form of treacle not oil. The urge to touch and the connotations of taste bring in the element of human presence which is hinted at throughout her work. Not only does it have sensory appeal, but also a physical one. The layout of her works in the space forces you as a viewer to navigate your own route; there is no direction, again merely the element of chance. 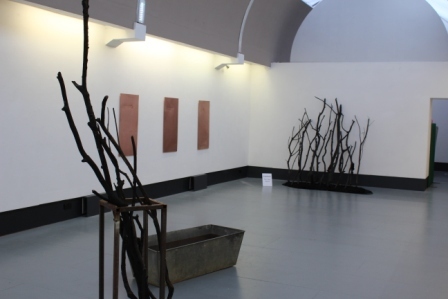 I think my favourite works were the copper plates. 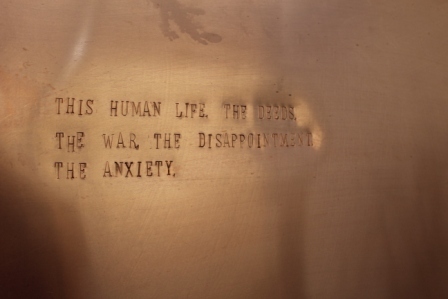 I loved how beaten they were, how handmade they looked yet at the same time, how the words were perfectly formed. I’ve worked with copper before and it is not the most obedient of materials! It can also be a very laborious process, but I feel this comes naturally to Daglish in her work, there is a strong sense of will to push boundaries. The words beaten out hinted at the source of Daglish’s inspiration for all of this: Greek mythology. Her exhibition guide reads: “Ichor is the ethereal fluid that is the God’s blood; said to hold the qualities of the immortal’s food and drink; ambrosia or nectar. Golden in colour, Ichor is considered to be lethally toxic to humans.” It sounds so lyrical yet simultaneously menacing. And I suppose in my opinion that sums up her pieces. They are all works of contrast, feeding off each other in a dialogue where material is the undercurrent for it all. Touch, taste and human traces are all integral in this journey of material exploration. And what an experimental journey it has been for Daglish.